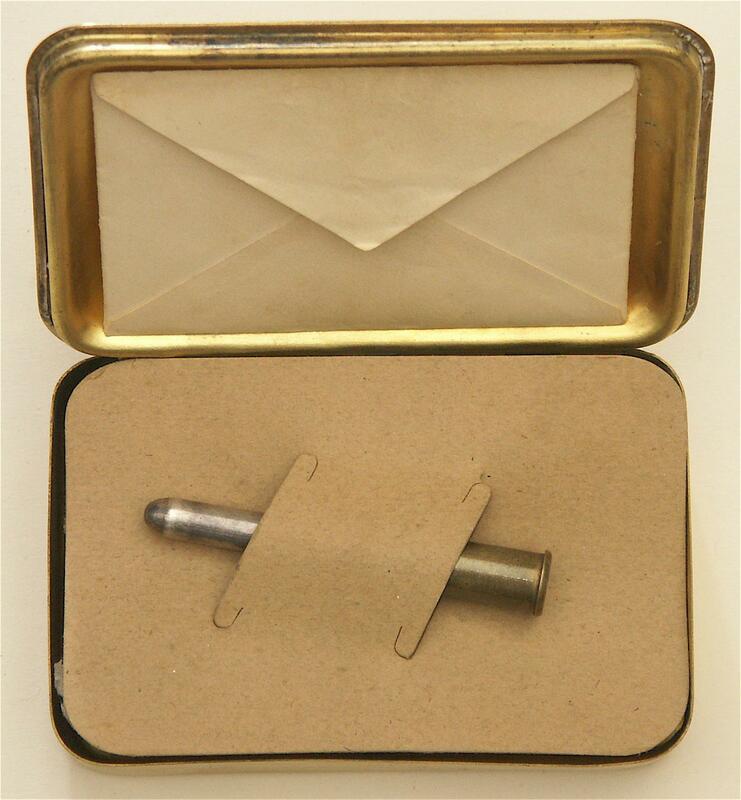 An item found in many New Zealand homes, collections, second hand shops and in on-line and catalogue auctions is a small brass 5inch long by 3 ¼ inch wide by 1 ¼ inch double-skinned, hinged brass tin. Its identity is reasonably well known but mystery tends to surround how this “Gift” came about and the array of contents that once brought much pleasure and comfort to beleaguered men serving King and Country in the ‘War to end all Wars’. As a collector of British Militaria the writer is the fortunate custodian of several tins and a range of contents. Questions about these quaint tins and discussions about contents that surface from time to time are a periodic feature of the NZAHAA Canterbury Branch meetings. From time to time the writer also receives requests for copies of notes and information he has collected on the “Gift”. This article therefore represents an interpretation of the wide range and sometimes conflicting pieces of information sourced over the past 30 years from books, newspaper articles, web sites, museum records and fellow collectors. During World War One King George V and Queen Mary got very involved in active war work. The King mainly visited battlefields (as recorded on the ‘King at the Front’ postcards) while the queen organised clothing drives, visited hospitals and other welfare organisations. Princess Mary, then 18, often accompanied the Queen and according to the book “Princess Mary, Viscount Lascelless” became intensely concerned, with Christmas looming, about the well-being of the soldiers and sailors serving far from home. With her parents consent the following letter of appeal was published in November 1914. “ For many weeks we have all been greatly concerned for the welfare of the soldiers and sailors who are so valiantly fighting our battles by land and sea. Our first consideration has been to meet their more pressing needs and I have delayed making known a wish that has long been in my heart, for fear of encroaching on other funds, the claim of which have been more urgent. I want you all to help me send a Christmas present from the whole nation to every sailor afloat and every soldier at the Front. On Christmas Eve, when, like the shepherds of old, they were wont to hang out their stockings, wondered what the morrow had in store. 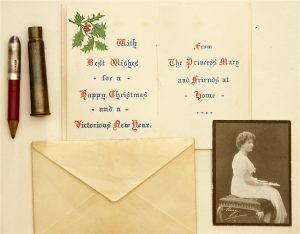 I’m sure that we should all be happier to feel that we had helped to send our little token of love and sympathy on Christmas morning something that would be of useful and permanent value, and the making of which may be the means of providing employment for trades adversely affected by the war. Could there be anything more likely to hearten them in their struggle than a present received straight from home on Christmas Day? Please will you help me Mary”. In support of this appeal many periodicals of the day published or referred to her letter. The following example appeared in the Illustrated War News of 4 November 1914 “Princess Mary is appealing for help to send a Christmas present, from the Nation, to “every Sailor afloat and every Soldier at the front”. Remittance should be addressed to H.R.H. 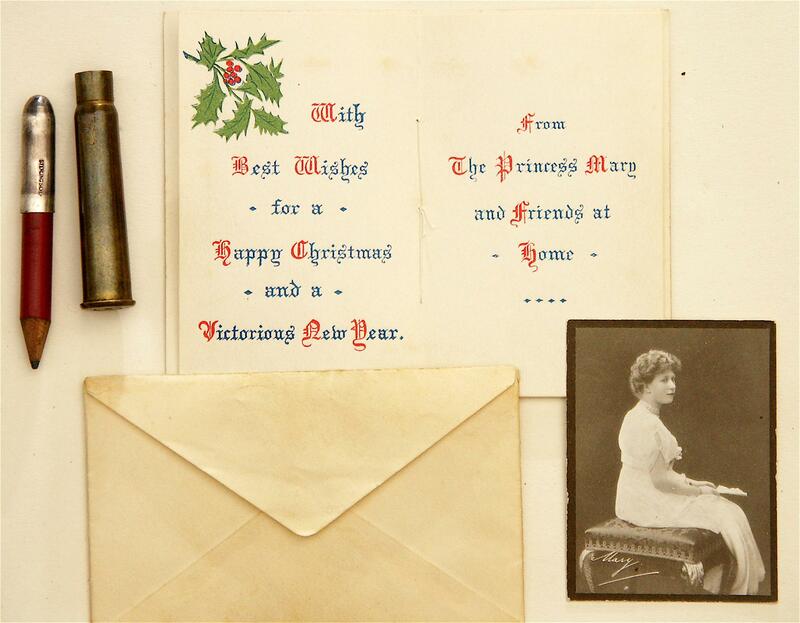 the Princess Mary, Buckingham Palace, S.W., the envelopes marked “Sailors and Soldiers Christmas Fund”. The appeal was very successful for it had reached 131,000 Pound by 16 December . In true English tradition Her Royal Highness appointed two committees to carry out the scheme. A General Committee comprising Prime Minister (the Right Honorable) H Asquith, First Lord of the Admiralty Winston Churchill, Secretary of State for War Earle Kitchener, many other M.Ps, senior Military Officers and also the High Commissioners for the Dominions (Australia, Canada, South Africa, and New Zealand) administered the Fund. The bulk of the work was however done by a smaller Executive Committee Chaired by the Duke of Devonshire with Rowland Berkeley as Honorary Secretary and Lord Revelstoke as Treasurer. Wrestling with what the tin and contents would be, the criteria for eligibility and the problems of producing and disseminating the “Gift” kept the Executive Committee busy for the best part of six years. The inaugural meeting on 14 October decided that the “Gift” would take the form of an embossed brass box containing a range of gifts. 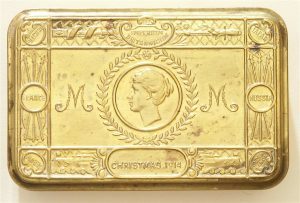 The box, designed by Adshead and Ramsey, has an embossed lid bearing the head of Princess Mary in the centre, surrounded by a laurel wreath and flanked on either side by the “M” monogram. At the top, a decorative cartouche contains the words “Imperium Brittanicum” with a sword and scabbard either side. On the lower edge another cartouche contains the words “Christmas 1914” which is flanked by the bows of battleships ploughing through heavy seas. At the sides and corners in small roundels are the names of the Allies – France, Russia, Belgium, Japan, Serbia and Montegro. On both sides are three furled flags. It was initially decided that the “Gift” would be received by every sailor afloat and every soldier at the Front wearing the King’s uniform on Christmas Day 1914. The difficulty for the committee was deciding how many to get manufactured. They calculated that 145,000 sailors including Royal Marines and 350,000 soldiers including the Indian Contingent qualified. It was therefore calculated that between 55 and 60,000 pound would be needed to cover the cost of nearly 500,000 gifts. 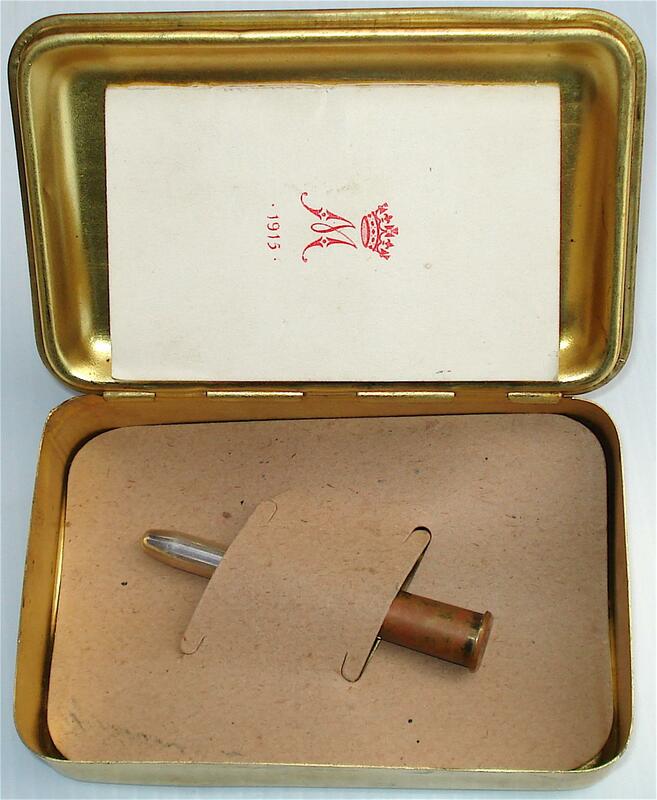 Shortage of brass, probably because its use in important war time items such as cartridges and shell cases, and reluctance from firms to get involved caused delays in the manufacture of the box. Eventually contracts were signed by 4 firms to produce 498,000 tins at a cost of 6 1/4d each. The Committee also placed a large order with the USA for additional brass but this was lost when the Ship carrying it, the Lusitania, was torpedoed on 7 May 1915 by a German submarine and sunk of the South Coast of Ireland. Further quantities of strip brass were then supplied from North England on an ‘as and when available’ basis. The public appeal through a well thought out publicity campaign worked exceedingly well with most of the money raised coming from thousands of small gifts from ordinary people country wide. At the second meeting of the Committee on 20 October Treasurer Berkeley revealed that the Fund stood at just over 12,000 pound. It was further reported that it had risen to 31,000 pound a week later. It is interesting that the Sunday Times on 18 October 1914 reported a positive public response to the appeal along with a long list of the rich and famous who had contributed. On 27 October 1914 the Executive Committee was informed that 39,200 appeal letters had been posted to individuals, 7,000 to those with more than 5 servants, 1,500 to social clubs, 1,500 to golf clubs, 1,000 to schools and 2,600 to Masonic Lodges. Collection boxes were also placed in shops, hotels and theatres. The Committee did however forbid street corner collections. Supplying the contents for the first order of tins required larges quantities of each item – 44,840 lbs of tobacco, 710,069 pipes (of all different shapes and sizes), 13,050,000 cigarettes and 500,000 cards (dated 1914 on the front cover and under The Princess Mary Monogram and with the words ‘With Best Wishes for a Happy Christmas and a Victorious New Year from the Princess Mary and Friends at Home’ as per the example photographed). 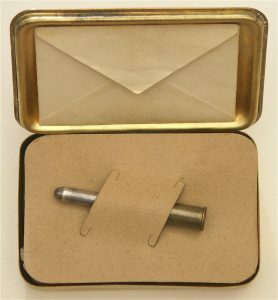 Asprey were unable to supply sufficient tinder lighters so the committee was forced to buy up alternative items including bullet pencil cases (sterling silver bullet shape with pencil in a Princess Mary monogrammed used .303 cartridge case), tobacco pouches, shaving brushes, combs, pencil cases with packets of postcards, knives, scissors, cigarette cases and purses. Many of these items were sent and issued separately as it was impossible to fit all the appropriate contents in the one tin. By the end of November the appeal fund was in surplus by 37,000 pounds so the Committee decided to extend the recipient list to include ‘every man (and woman – nurses) wearing the Kings uniform on Christmas Day 1914’. This increased the number to receive the “Gift” to a staggering 2.62 million. The standard “Gift” for officers and men in the Navy and at the Front (including wounded men on leave) was the box, a pipe, an ounce of tobacco, a packet of 20 cigarettes, a tinder lighter or one of the alternative items (often a bullet pencil case), a Christmas card and a photograph of the Princess. The Committee, like those that many of us serve on today, felt obliged to be politically correct and consider the non-smokers and the dietary and religious rules of various groups. What it came up with having consulted English Officers with much experience working with all these groups were a range of gift options. 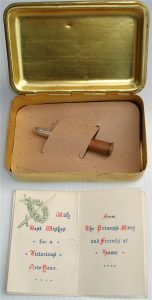 Ghurkas were to receive the same gift as British and Empire troops; Sikhs, the box filled with sugar candy, a tin of spices and the Christmas card; all other Indian troops, the box with a packet of cigarettes, sugar candy, a tin of spices and the card; nurses at the Front, a box, a packet of chocolate and the card; non smokers, a box with a packet of acid tablets (variably referred to in some of the references as sweets), a khaki writing case containing pencil, paper and envelopes with the Christmas card and photograph of the Princess. With the decision to widen the eligibility the Committee realised that it would be mission impossible to manufacture and distribute all the “Gifts” on Christmas Day. It was therefore decided to divide the potential recipients in to three classes. The first class, ‘A’, were to receive the “Gift” on or near Christmas day. Making up this class were the Navy (including mine sweepers and dockyard officials) and troops and nurses at the Front in France, men on furlough, prisoners (for whom the “Gift” was reserved), members of the French Mission with the Expeditionary Force and the widows or parents of those who had been killed in action. New Zealand Author Jennifer Beck and Artist Lindy Fisher in their children’s book “A Present from the Past” have highlighted for the children of today the importance of this positive and much appreciated memento in our military history and the role women played in Wartime. This book was a finalist in the 2007 New Zealand Post Book Awards. On 15 January 1915 and after the delivery of Class A “Gifts” the Committee met to decide how best to supply and distribute the remaining 1.8 million “Gifts” for Class B – all British, Colonial and Indian troops not in Class A serving outside of the British Isles – and Class C – all troops in the British Isles. 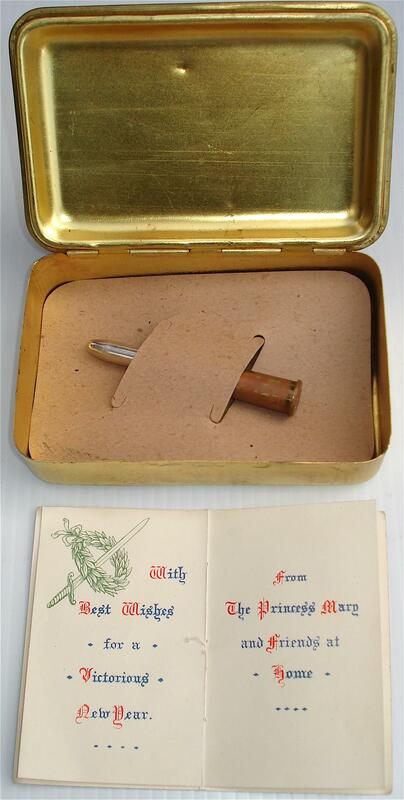 In an attempt to simplify the process they decided not to include different contents for other races and religious groups and settled on the box, a new years card (now dated 1915 on the front instead of 1914 and with the words Christmas Day now excluded from the massage inside) and a bullet case pencil. About 90% of these “Gifts” that turn up in NZ were of this type. The photographed example was posted from Base Records in Wellington on 24 February 1921 to R.M. 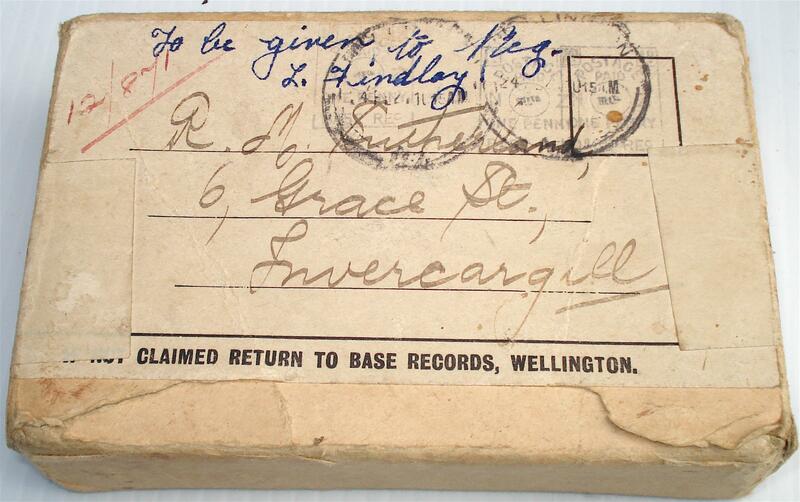 Sutherland 12/871 from Invercargill who served with the Auckland Regiment Main Body and was wounded at Cape Helles on 14 May 1915. In January 1919 the War Office reported that 252,250 “Gifts” had not been distributed so the Committee placed adverts in newspapers. The Committee received a large number of requests from soldiers claiming not to have received the “Gift” which no doubt caused considerable headaches checking on their validity. 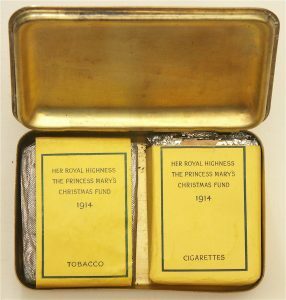 Prior to the winding up of the Fund in 1920 Princess Mary presented specimens of the “Gift” to the Imperial War Museum (along with the dies for the box lid and the proof box lid) and 198 War Museums in the country. “Gifts” were also sent to India, Canada, Australia, New Zealand, South Africa, Rhodesia, the West Indies, Fiji, and many Eastern, African and Mediterranean Colonies and Protectorates. The final Fund total was reported by the Committee on 30 June 1919 as 193,667 pound 4s and 10d. Monies from the fund is also reported as having been used, to buy War Bonds and, in War Loans. The funds that remained at the end were apparently transferred to Queen Mary’s Maternity Home founded for the benefit of the wives and children of sailors, soldiers and airmen of the newly formed Royal Air Force. So why did so many of these special “Gifts” end up in New Zealand? In 1914 New Zealand had a population of just over one million with 120,000 enlisting to serve with imperial or Australian forces with almost one in six dying in or because of the war. 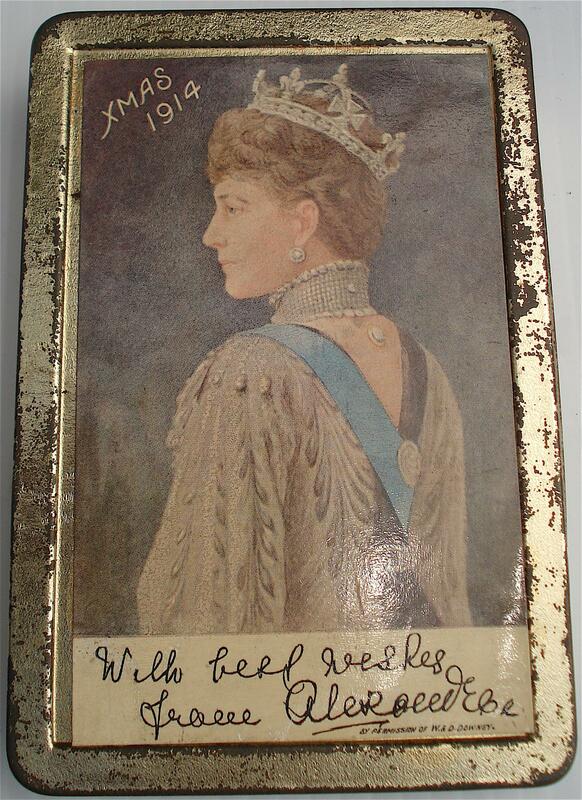 As an aside it is also interesting to note that Princess Mary’s Grand Mother and Queen Mother Alexandra also had a 1914 tin that probably contained cigarettes. 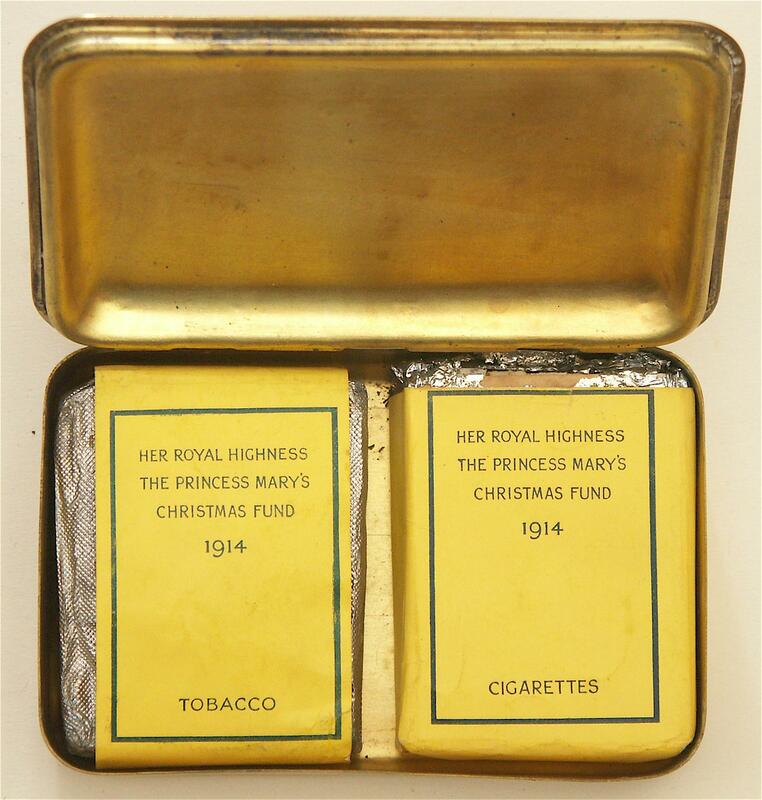 The tin was likely to have be sold to raise funds for the British Red Cross as the Queen Mother as a favourite of the ‘commoner’ championed the cause of nurses. Her name was also associated with the Queen Alexandra Imperial Military Nursing Services since 1902. 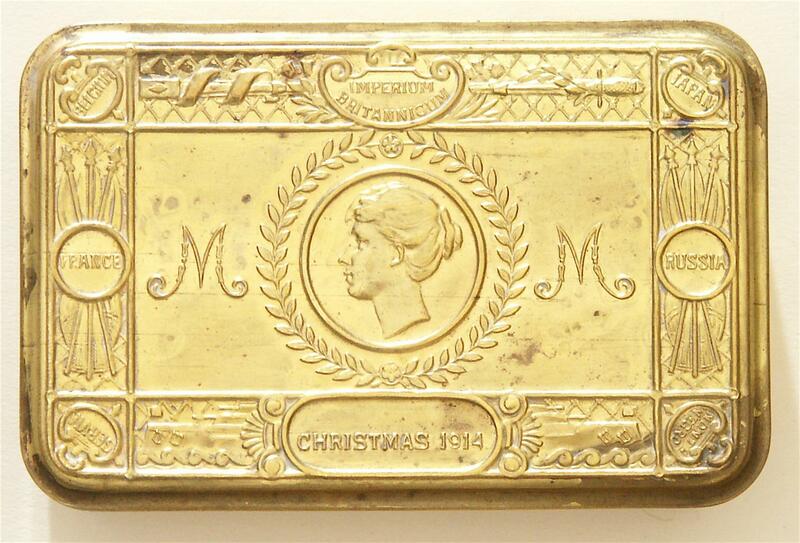 By all accounts Princess Mary was well satisfied that her desire to send ‘a little token of love and sympathy’ to all men and women serving King and Country had been successful. It would also seem that her secondary intention of giving them something that would be useful and of permanent value had also been achieved. 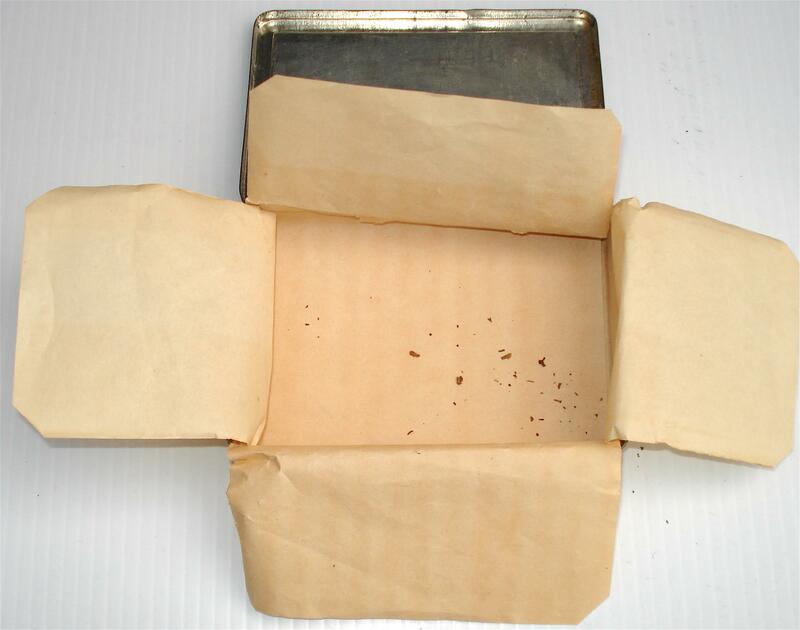 While most who received the “Gift” consumed or used the contents, the tins became useful for carrying other small items during and after the war. Most tins still hold to this day badges , insignia and ephemera saved as keepsakes by survivors of a very patriotic era. Luckily for us many of these tins have been passed from generation to generation as permanent mementos of a forebears contribution to the Great War. Contents are on the other hand reasonably hard to come by. If you are lucky enough to be custodian of the box and or some of its original contents you have a responsibility to preserve Princess Mary’s legacy for future generations.